You can define new content modification policies for use to suit your organizations’ requirements. 1. Go to Guardian > Content modification > Content modifications. • Name — The name of the content modification policy. • Comment — Enter an optional description for this policy. • Tenant — Optionally, select which tenants use this category. 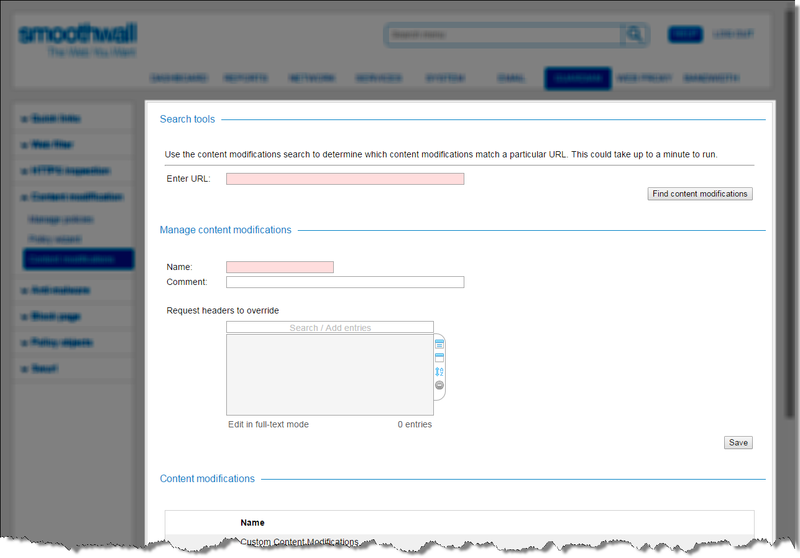 Specifying the tenants enables your Smoothwall System to apply network and web filtering permissions to users coming from different tenants with usernames which are the same. To create a custom category for all tenants, leave the Tenant drop-down as All. Tenants are only available if you have the correct your Smoothwall System license type and they have been configured on the System > Administration > Tenants page. For information about tenants, see About Multi-Tenant Managed Services . For more information about licensing your Smoothwall System, contact your Smoothwall representative. • Request headers to override — Enter the algorithm to use the requested website’s capability to override HTTP headers sent to it, and redirect users to other content. Only one entry is allowed per line. where Abc_dEf is the search term or phrase which causes the redirect. Note that an account and key must be setup on YouTube for this to work — for more information, refer to http://www.youtube.com/schools. Note that for a Google Apps restriction, HTTPS interception is required as Google Apps uses HTTPS throughout.